There are certain beauty products that have the power to transform your mood instantaneously and H20 Sweet Berry shower gel is just one of them. With its refreshing sweet scent and rich sparkling pink colored gel it can turn your regular bath routine into a pampering spa experience at home. This is my second shower gel from H20. And just like the first one, Orange Bloom, this one too came as a free gift in my January Fab Bag subscription. Loved the H20 shower gel in Orange Bloom and so had high expectations from this one as well. Now whether this shower gel succeeded in fulfilling my hopes or not, read full review to discover. Today morning, when I ran out of my regular Dove body wash, I brought this Sweet Berry shower gel from H20 into shower with me. And girls guess what? I just couldn’t stop sniffing my skin! It smelled so delicious! Although, Sweet Berry refers to the scent of this shower gel but the fragrance reminded me more of those sweet candies and jelly filled toffees that we used to enjoy in childhood. And even though, I am a sucker for floral and citrus scents, found this sweet candy smell simply irresistible and nostalgic! The shower gel comes in see through plastic tube packaging with a white flip to open cap. And the fact that the gel inside is a pretty pink with sparkling white beads adds pizzas to the already ‘oh-so-lovely!’ sweet and girly packaging. However, while I adored the pink tint and sweet fragrance of this shower gel, found the texture of this body wash to be quite sticky. It has a jelly like consistency that sticks to the skin making rinsing off into real hard work. But in the end, the hard work pays and you are left with silky smooth and squeaky clean skin! True to its claims, it does not dry the skin. The vitamin E in this shower gel hydrates the skin and antioxidants provide nourishment. My skin felt so soft and clean after using this shower gel that I did not feel the need for a body lotion after bath! Now comparing this with Orange Bloom shower gel from the same brand and of the same price, this one definitely becomes pricier as it does not lather much and is stickier in texture. You really need large amount of this gel to distribute and lather evenly on your skin. So price is a big con, when it comes to buying H20 Sweet Berry Shower Gel. But since I got this shower gel as a free gift, I didn’t mind the price and simply love the fact that how cute this sparkling pink tube looks and feels in my shower! 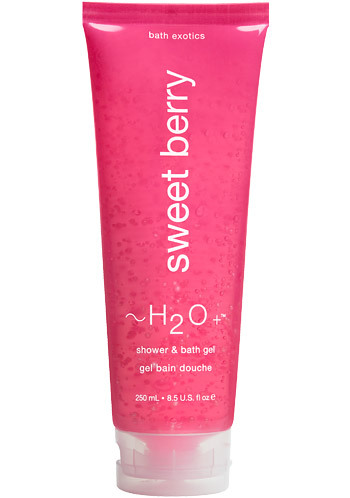 Overall, it’s a decent bath product from H20 with unique sweet berry scent. Delicious scent and rich pink tinted texture offers for a pampering spa experience at home. Leaves skin clean and smooth. But thick, sticky consistency makes it difficult to rinse off and lather. Also since it’s a premium shower gel on the higher price range, do consider all the above mentioned pros and cons of H20 Sweet Berry shower before purchasing it. I prefer body wash with citrus!